Few aspects are highlighted just to give the reader an idea of what to expect in the next 200 odd pages. This will boost your urge to complete the book in one sitting. At times participating in Forum discussions can help you a lot in Finding a mentor and being a mentor. Also I would encourage participating in the open source communities and try reading the code and writing patches (This is something I didn’t do and I would encourage people to practice this right from their under-graduate studies). 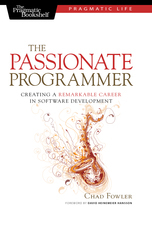 Reference: Book Review: The Passionate Programmer written by Chad Fowler from our JCG partner Mohamed at the “Experiences Unlimited” blog.